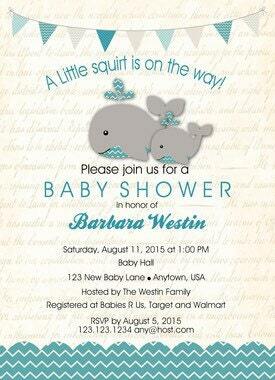 Elegant Blue whale baby shower invites that will set the tone for an elegant baby shower for the mommy to be. This whale invitations can be used for a birthday, shower, etc. Just let me know what you are wanting and I will be happy to help you! A 4x6 or 5x7 DIGITAL PRINTABLE invitation design, personalized with your information. Your proofs and printable invitation will be sent to the email you provided. You will be allowed to text revisions after initial proof review. We will always correct any mistakes made by us. After approval, we will send you a high-resolution file ready for printing. You can print at any Commercial printer, office supply store (Office depot, etc.) or photo lab (Wal-Mart, etc.). You can also print at the comfort of your own home! This file is for personal use only. Mass production, file sharing & commercial use are not permitted.